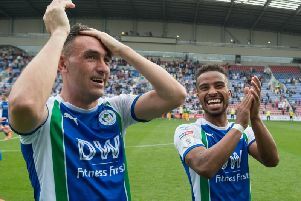 Paul Kendrick runs the rule over the Wigan Athletic side that overcame Rotherham United 1-0 and delivers his report card. Christian Walton: 7 - Didn’t have a lot to do but there when required to pull a couple of fine saves at vital times. Reece James: 8 - Hard to believe this lad is only 18, plays with the maturity and presence of a seasoned performer. Chey Dunkley: 8 - The senior figure in this new-look defence but leading by example and made an impact in both boxes. Cedric Kipre: 8 - Arguably his best game for the club, stood strong when required but also impressed with timely interventions on the deck in a frantic finale. Antonee Robinson: 8 - Has to be up there with the fastest players ever to play for Latics, can turn defence to attack in seconds, two players in one. Sam Morsy: 7 - Typical performance from the skipper, kept it simple, available at all times, set the tempo and conducted the orchestra. Lee Evans: 7 - On another day his set-pieces would have reaped greater rewards, a tailor-made companion for Morsy in the engine room. Josh Windass: 7 - First home start and looked busy to impress from the off, not afraid to shoot and promising signs for the future. Callum Connolly: 7 - Given the nod in his most advanced role yet with Jacobs and Massey out, and proved his versatility once again. Nick Powell: 6 - Not his day for once, put himself about and refused to be bullied but hooked on the hour mark. Will Grigg: 6 - Like Powell, worked tirelessly without joy, one delicious cross from Robinson had ‘goal’ written all over it before being cut out, summed up his day. Callum McManaman (for Powell, 60): 7 - Latics desperately needed creativity and he provided it, laying on the winning goal and coming close on another occasion. James Vaughan (for Grigg, 60): 7 - Right place at the right time and a nudge to the manager for future inclusion. Joe Garner (for Windass, 90): Not sure if he touched the ball but great to see him finally on the field. Jamie Jones, Alex Bruce, Nathan Byrne, Gary Roberts. Rotherham: Rodak; Vyner, Raggett, Wood, Mattock; Ajayi; Wood; Taylor, Vaulks, Manning, Williams; Smith. Subs: Palmer, Proctor (for Wood, 77), Towell, Robertson (for Raggett, 19), Vassell (for Taylor, 59), Newell, Bilboe.